Play, discover and explore – we encourage you! A walk in the Castle Park sounds wonderful to you – but maybe your children are not quite as excited as you are. We have made extra-special arrangements for our youngest visitors at Lütetsburg Castle Park: A large play area is open to children aged 3 to 10 years in the entrance area. 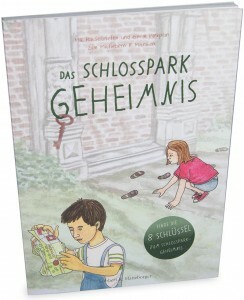 “Schlossparkgeheimnis” a children’s puzzle book, makes for an exciting tour of the park. With this book, children embark on an adventure through time! By solving riddles all about Castle Park, they hunt for eight keys with which they solve the mystery and save the park! The detective story vividly told and charmingly illustrated by Lübbert R. Haneborger ranked third at the German “Gartenbuchpreis” 2014 (Garden Book Award) in the category “Best book on garden history.” The puzzle book is available in the Park Shop of Lütetsburg Castle Park. 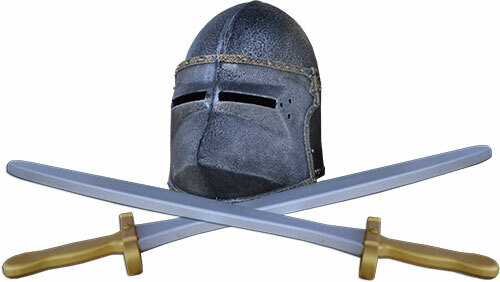 In the Park Shop you’ll also find knight supplies of all shapes and sizes, as well as explorer tools for an expedition through the Park. Children up to 12 years enjoy free entry to Castle Park in the season (April to the end of October) during the opening hours of the Park Shop.